Fewer than half the homicides in Columbus were solved last year. That’s down compared with the previous four years, when police cleared 54 percent of the 392 homicides within the city’s borders, a rate that mirrored numbers across the country for similar-size cities. Solving 42 of 90 homicides last year in Columbus represented a 47 percent clearance rate, the lowest since Columbus saw 108 people killed — and 45 percent of the cases cleared — in 2008. Whether a case is solved depends on a variety of factors, from where the homicide occurs to what kind of weapon is used. 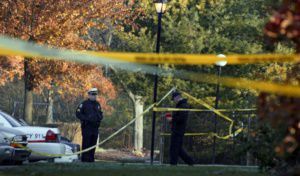 And the success or failure in solving a case does not necessarily reflect on the detective or squad working it, experts say. The 10 homicide detectives whom Sgt. Christ Holzhauser supervises during second shift handled about half of the city’s killings last year — 44 of the 90. He said he pays close attention to clearance rate, keeping the number posted near his desk, so he can look at it throughout his shift. "I think it’s relevant," he said. "However, it’s so situational." A shift can have a run of cases that are quickly resolved — such as a murder-suicide or a case of self defense — while another detective or squad is left with cases that are less clear-cut, such as a drive-by shooting or a body that went undiscovered for weeks. "It doesn’t clearly define how well a squad or detective is doing," Holzhauser said. "It’s not like you can handpick the cases you get." Richard J. Lundman, an Ohio State University sociologist who studies homicide, said there are fewer arrests in killings in predominately black neighborhoods, where there’s less trust and cooperation with police. And the circumstances of some cases just make them more difficult to solve. "It does not have anything to do with how hard homicide detectives work particular murders," Lundman said. "It has to do with the amount of cooperation and information they get." It also depends on evidence and witnesses, said Sgt. Rich Weiner, a police spokesman. "We want to solve them all, but we are realistic that the chances of that happening are very low," he said. Homicides have the highest clearance rate of all serious crimes, but during the past 30 years, that rate has dropped. In 1980, 72 percent of homicides were cleared nationwide, compared with 64 percent in 2008, according to a 2011 study by the Bureau of Justice Statistics. In 2011, cities with 500,000 to 1 million residents had a total of 1,756 homicides. About 53 percent of those were cleared. Columbus performed slightly better, with a 55 percent clearance rate in 2011. National data for 2012 are not yet available. A case is cleared, or closed, with the arrest, death or identification of a suspect. Most of Columbus’ 42 cleared cases last year were closed by arrest, though three suspects committed suicide. The 48 unsolved cases include that of Dean G. Reinhard’s son. It has been nearly a year since Dean K. Reinhard’s body was found in a North Side trash bin. The 45-year-old man had been strangled. No suspects have been identified. Reinhard, 72, said it doesn’t matter if his son’s killer is found. He has already forgiven the person. "The fact that it’s unsolved is not necessarily important to me," he said. "You have to move on." Instead, he remembers the Ohio State football and basketball games he and his son watched, his son’s graduation from Ohio State and the 30 years they worked together in his law office. The younger Reinhard had bipolar disorder but had lived a full life until he was found dead on Jan. 25. "I think about him a lot, but I don’t dwell on the incident," his father said. Reinhard praised the detectives who have worked the case — Ron Custer and Linda Rice — for their professionalism and communication. He doesn’t blame them that no one has been arrested. "This was a difficult case to investigate," Reinhard said.